Oric-1 mode did not work either. Trying to load it with "not turbo" mode . It is so nostalgic to hear those tape sounds but soooooooooooo long to cload Were we patient enoght to wait that much? I hope it works though. Still waiting to load. In answer to Peacer. Either turn off the turbo load feature of Orictron, or set Oricutron to Oric-1 mode. Either of these fix the tape loading error. Oricutron does not run the tape image. When you load it says "tape error" Any chance to get a working copy? I am ashamed to say, I bought a book, that book was titled: How to play The Hobbit... Fun looking back now. I should scan the cover. 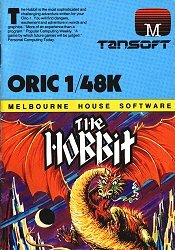 One of the best adventuregames for the Oric. If you like J.R.R. Tolkien you like this game. It was really challenging with lots of tricky solutions. VBLA said "Unfortunatelly a 'bug' prevented me from ending it" Indeed! and about two years ago, the same bug prevented me from finishing it too! is THERE a way to finish this game? 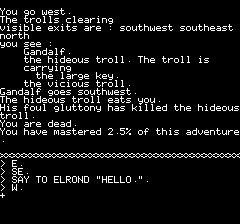 This was a reasonably good adventure, nice graphics at some of the locations and the most advanced parser available on the Oric until Pinforic came along. Text could be entered in more advanced ways than just the tradition VERB NOUN type input. TELL THORIN TO "STOP SINGING ABOUT GOLD OR HE WILL GET THUMPED" or GO NORTH AND GET THE RED KEY were acceptable inputs for example. Several of the characters you met had minds of their own, but those minds were tiny! 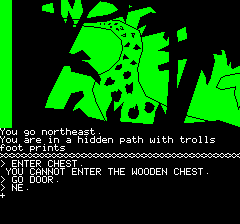 Unfortunately, I found that the maze under the misty mountains was just too infuriating for me to be able go any further and the graphics routines were a bit slow. Still, an interesting piece of software all the same. For me the best adventure for the Oric. Unfortunatelly a 'bug' prevented me from ending it. I could only finish it now that I am old :-) with the emulator.